Expertise. We know how to design around optics (see our article on Packaging Optical Systems)and electronics, and we understand all the common production methods used to produce designs involving optics and electronics. 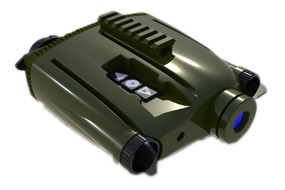 We're very familiar with Military night vision as well as complex electronics. We also understand the design process and documentation. We'll be happy to answer any further questions you have about our expertise as it regards your particular project. Creativity. You're not coming to us for a run of the mill design that does a basic job. You want a design that does what's required in a creative and efficient way, is aesthetically appealing to your customer, is easy to use, and is original. You want a creative solution that thrills your customer and makes you money. Creativity is part of who we are. You won't be disappointed. Capability. We have connections to a lot of design resources, from optics design to industrial design to software development. We can pull together a team to address a wide range of project needs. We can supply names and resumes if absolutely necessary, along with a project plan and development schedule. If we think your project is beyond our capabilities, we'll tell you so. We don't want to waste your time, but don't sell us short. We know how to get a design done. Availability. This all depends on the current situation. If we're really busy, we may not be able to help you. Most of the time we can at least talk to you about what you need and give you a good answer as to what we can do for you at a given time. We can also find resources to help. Reliability. You won't have to wait a week or two for us to respond to your communications. We'll be there for you to answer your questions and deal with emergencies as they arise. We'll do what has to be done, and we won't be the 'bad leg' that gives out when you're in a desperate situation. Knowledge of vendors. We know a lot of vendors. From plastic molding or machining to casting to specialists in exotic materials, surface treatments, or whatever, we know a lot of people all around the country and the world. If we don't know a vendor who does something you need, we know how to find one. Design Process management. We understand the design process, that it's a serial process, and it goes through stages. There has been a lot of talk about concurrent engineering and parallel design processes over the years, but design, by nature, is a serial process. No matter how many parallel processes you have working together, you can't design something until you have a concept, and you can't detail the design until you have a layout. Managing the process is checking each stage of the process for errors and keeping the design as closely tied to the original design task as possible. Error creeps in at every stage of the process and has to be dealt with in each stage before the design moves to the next stage. Documentation. We understand documentation. If you don't know what revision you're working with or the revisions don't match, you've got a serious problem. We keep the 3D models and the drawings synchronized, and we eliminate all extraneous or unnecessary information in them. This is one of the hardest parts of managing the design process. We make it a point to document each change and keep the design up to date. Commitment. We will get the job done. We carefully compare your requirements to our ability before we start anything, and we make sure we can get the job done first. Once we've determined that we can do the job for you, and you keep your part of the bargain by paying us on time, we will finish the job. You will get a completed design that meets your requirements, on time.